Partitioning in different purpose premises is the one of the main activities of Vitality Contractors LTD company. Partitioning is carried out at a relatively low cost and in a reasonable time, as the destruction of walls and floor is not required. 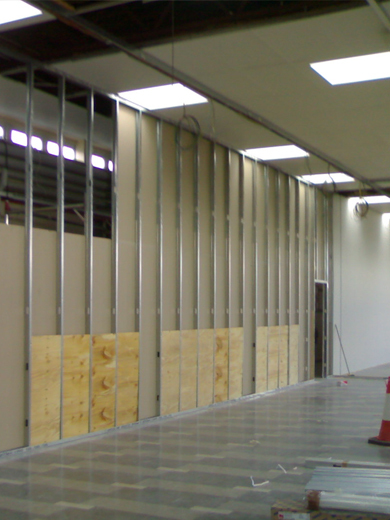 Many types of partitions are easily dismantled and transported if necessary. By the type partitions can be stationary and mobile. Stationary or capital partitions are suitable for long-term operation. Mobile partitions can be used as a screen. Depending on the material stationary partitions have different properties: soundproofing, light transmission, the ability to install attachments so can be fixed to the ceiling, walls or floor. Mobile structures are basically limited by the territorial-fencing function. Plasterboard is a non-toxic, environmentally friendly, odorless and not heavy material so it’s easy to use and to remove if necessary. Plasterboard partitions perfectly hide communications, uncomfortable shelves and niches, absorb moisture in the high humidity of air in the room and vice versa,moisturize it, creating a favorable microclimate in the room if necessary. Processed by sound-absorbing material such as cotton wool the multi-level plasterboard construction has a perfect insulation performance. The plasterboard partition construction has insignificant strength and is easily damaged with intensive action, therefore the pros and cons of installing the gypsum plasterboard should be weighed for each specific case, taking into account the specificity of the premises. The walls made of decorative bricks are very suitable to separate the space in the country and provence style. Despite the originality of design before this type of partitions application it is desirable to take into account the difficulties in their disassembly. Most often glazed partitions are found in office premises, shopping centers. They visually preserve the scale of the space, are durable and safe, have good sound insulation, can be covered with a fireproof or shockproof foil. There are the fully glazed and wire framed glazed partitions. The fully glazed ones create the effect of walls absence and the wire framed look more monumental. However, glass requires special care and thorough wiping. The wood partitions have a rich view and are suitable for different styles. The curtains on the cornices under the ceiling can be used to install the partition for a short time or if there is no need to build a fundamental partition. Also the perfect look have shelf, door-compartment and openwork partitions. Openwork partitions are made of metal or wood, look great and don’t take up much space. The rail and door -compartment sliding partitions can be used if the person need to be separated during the work or rest. Thus, choosing the type and structure of the partition, it is necessary to provide all the features of its further use, pay attention to materials, structures and accessories. On these issues it is advisable to consult with a specialist who will suggest the most appropriate option based on the specifics of the situation.